Preheat oven to 350 degrees. Spray an 8" X 11 1/2" baking dish with cooking spray. In a separate baking dish place lasagna noodles and cover with boiling water. Let sit for 15 minutes while making the sauce. 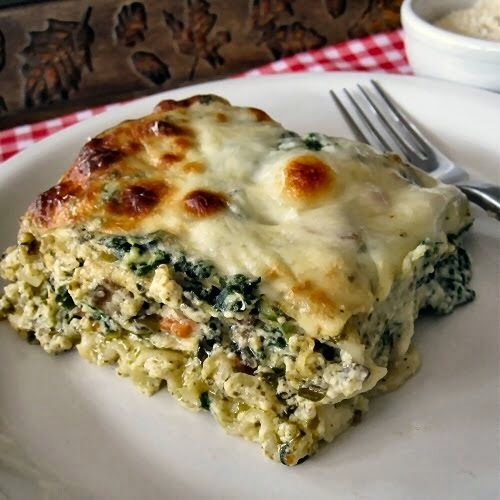 In a medium size mixing bowl, combine the spinach, ricotta cheese, garlic powder and egg. Season well with salt and pepper. Set aside. In a large skillet heat olive oil and butter over medium heat. Add the onions and bell pepper, season with salt, pepper and crushed red pepper flakes and saute until onions are translucent, 6-7 minutes. Add the mushrooms and continue to saute until mushrooms lose their moisture, another 5-7 minutes. Add the garlic and saute for another minute or two. Sprinkle the flour over the vegetables and stir to combine. Continue cooking and stirring over medium heat for two minutes. Add the milk and half & half, bring to a boil, reduce heat and simmer for 4-5 minutes until sauce has thickened a bit. Remove from heat and stir in 3/4 cup pesto. Taste to see if salt and pepper are needed. Spoon 2 TBSP of the pesto on the bottom of the prepared baking dish. Lay three noodles on top of the pesto. Top with 1/3 of the basil cream sauce (about 1 1/2 cups) and spread to cover noodles. Dollop 1/3 of the ricotta mixture on top of the sauce, then top the ricotta with 1/3 of the cheese slices. Repeat layers two more times. Sprinkle parmesan cheese over the top. Cover tightly with aluminum foil and place dish in oven. Bake for 25 minutes, uncover, then bake for another 25 minutes, until bubbly and browned. Let dish sit for 10-15 minutes before serving.